Tomorrow (Saturday, July 31), I'll be a guest on Digital Village, a weekly computer radio show that airs on KPFK, 90.7 FM in Los Angeles. I'll be on from about 11:30 am to noon Pacific time. And of course you can listen live on the Internet -- and with iTunes, no less. Ad don't miss Digital Village Dispatch, a blog about life in this digital village from hosts Ric Allen and Doran Barons. That's Saturday, July 31, 11:30 am to noon! Now that Apple has shipped its AirPort Express portable base station and music sharing doodad, everyone seems to be talking about streaming music throughout their houses. Jonathan Q. Woolson is way ahead of them. Jonathan is the superbly talented designer and compositor who has produced all three editions of my iLife book, not to mention the eBay seller's guide that I co-authored with Toby Malina. He's also a serious Mac geek. He recently wrote to tell me about a home media system that he created using a variety of off-the-shelf components -- including a PowerBook G4 with a broken screen that he bought on eBay. He calls his system iHome, and here, in his words, is how he describes it. Integrate our computer, audio, and video devices into a single, switchable system to make it easy to listen to music from iTunes or record audio and video to disk for editing and archiving. 2. Samsung 170MP 17" LCD monitor w/TV tuner. 3. Formac Studio/TV tuner FireWire A/D AV converter. 5. A stereo/DVD home theater-type system. The PowerBook G4/550, dubbed an "iServe," is a wafer-thin (.75" slab) personal home server that sips power at 45 watts, has built-in Gigabit Ethernet and operates entirely autonomously in headless mode, running the Mac OS X 10.3 client (not the server edition). I've attached a La Cie 200GB FireWire drive to hold the iTunes music library. I purchased the PowerBook/550 on eBay. It was advertised and sold with a broken screen. I removed the lid-screen assembly from the PowerBook, rendering it "headless" and helping to ensure that it would run cool. When I disassembled the lid/screen and disconnected its internal cables, I located the round, 1/8" magnet inside the lid that triggers the sleep switch beneath the PowerBook's trackpad. To trick the PowerBook into correctly feeding a single monitor/VGA output to the Samsung LCD and ignore its now-removed screen, I taped the magnet onto the trackpad directly above the sleep switch so that the PowerBook would run in "closed lid" mode. To keep the PowerBook running, I use a freeware utility called SleepLess. SleepLess keeps the computer running in closed-lid mode even when it is not connected to a VGA output (normally, disconnecting the VGA cable while in closed-lid mode causes the PowerBook to sleep immediately). I keep the iServe and its external hard drive in a closet to minimize drive and fan noise. At a great electronics store in Boulder, CO, I found a very substantial aluminum heat sink for $25 that measures about 2-1/2" tall and 8" x 10". This oversized heat sink moves heat from the entire bottom of the PowerBook and alleviates the need to provide more fans, allowing the PowerBook to run safely in a closet that has minimal air movement. 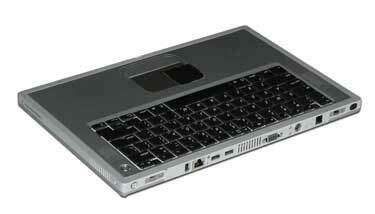 The PowerBook rarely spins its internal fans up to the first notch (there are two fan speeds on a TiBook/550). The Samsung 170MP LCD monitor/TV is both the monitor for the iServe and the main general-purpose TV/DVD/VCR display for the house. Its flexibility enabled me to build this whole integrated system without having multiple screens for using the computer and for watching TV/DVD/VCR. The Formac Studio/TV records video and television to disk. This provides TiVo-like function and converts VHS into iMovies. The two-part AV switch is just two standard five-position AV switches that have their primary single AV outputs wired together so that any one of five AV inputs can be manually connected to any one of five AV outputs. They were sold for switching between different console video game systems and cost about $30 each. The AV switch box assembly allows me to connect the video and audio from, say, the TV to the stereo, or the VHS to the TV, or the server's audio output to the stereo. One of the inputs is an 1/8" audio plug that can be plugged into any random/extra audio source like an iPod, a friend's laptop, or tape player to feed through the system for recording or playing through the stereo. The stereo is an integrated stereo and DVD/CD player home theater system. I've built a complete map of all the interconnections for whole system, which I call "iHome." The C. Crane FM transmitter broadcasts music/radio streams from the iServe out to radios in the kitchen and the bathroom. 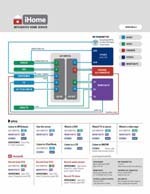 Download the diagram (1MB PDF). Hope you enjoy this bit of AV geekin'. To learn more about Jonathan's design and computer consulting services, check out his Web site. It's a big day here today. For one thing, this week's issue of Apple's eNews newsletter has some kind things to say about The Macintosh iLife '04. It's always an honor to be featured in this widely read email newsletter, and I'm grateful. For another, a project that I've been working on for the past several weeks has finally shipped. It's an instructional DVD called "Secrets of the Photoshop Masters, Volume 2", and it's from Avondale Media, the DVD- and seminar-production company for which I'm editorial director. Our "Secrets of the Photoshop Masters" series of DVDs is different from other Photoshop training DVDs. They aren't one of those $150, 12-disc sets featuring one guy droning on and on about the marquee tool. Instead, our "Secrets" series is more like a portable Photoshop conference -- we bring award-winning photographers and artists into our studio and tell them to share their favorite techniques and tricks. The result is a tight, lively presentation that constantly makes you want to reach for the mouse and try things for yourself. In Volume 2, we turned to three digital photography visionaries. Jeff Schewe is an advertising photographer in Chicago and the most brilliant digital imaging guru I know. It's frightening how much this man knows about Photoshop. Martin Evening is a spectacularly talented fashion photographer in London, and can also make Photoshop stand up on its hind legs and pose. Both Jeff and Martin are closely involved in the development and evolution of Photoshop. And then there's Greg Gorman. Greg has been photographing entertainment industry stars for 35 years, having captured everyone from Alfred Hitchcock to Rachael Welch to Johnny Depp to Halle Barry. He's recently made the move to digital, and along the way, developed an amazing technique for turning color photos into black-and-white ones -- a technique that yields far more control over image tonality than a simple convert-to-grayscale operation. That's the cast of "Secrets of the Photoshop Masters, Volume 2." Jeff Schewe demystifies the art and science of shooting in Raw format and working with Photoshop's Camera Raw module. Martin Evening shows how to create absolutely perfect image masks in a segment in which he superimposes a shot of a model against a New York street scene. And Greg Gorman philosophizes about his move to digital and then shows his black-and-white conversion technique. It's an hour of absolutely inspiring Photoshop CS, and I couldn't be more proud of it. We've also included portfolios that let you see more work from these amazing artists, as well as detailed PDF articles about Camera Raw, image sharpening techniques, and more. Enough of the hard sell. "Secrets of the Photoshop Masters, Volume 2" costs $49.95 and it'll change the way you use Photoshop CS. And, of course, it was made on a Mac: we ran Photoshop CS on a dual-processor G5, we captured the video directly to hard drives using Final Cut Pro, we edited the video in Final Cut Pro, and we authored the DVD in DVD Studio Pro 3 -- while listening to iTunes, of course. What a great computing platform. I was right and I regret it. In yesterday's post about the new, fourth-generation iPod, I wrote that Apple should make some of the new iPod's enhanced menu features available to users of older iPods -- but I predicted that it wouldn't happen. Apple has indeed released a new software update for the iPods, and it does not add revamped menus and enhanced on-the-go playlist support to third-generation or earlier iPods, not even the iPod mini. That's too bad. As I said yesterday, throwing a little bone to buyers of older iPods would be a nice consolation, a way of saying, "Yeah, so your iPod isn't the very latest one anymore. Here's a little something to make you feel better." Now, however, buyers must consider whether they also need or want the additional goodies that the fourth-generation iPod provides: the new menu scheme, the new playlist features, the audiobook speed-up/slow-down features, and so on. Buyers must compare the two iPod families carefully -- and the mini suddenly doesn't look as appealing as it did last week. The extra $50 that a new iPod costs over a mini now buys you a lot more than just several times the capacity. Paving the Way for Photos and More? And let me make one more Monday morning observation. The new iPod's main menu contains an item named Music. This marks the first time that the iPod user interface has required you to explicitly choose a Music command to get to your music. So what? So this: it seems to me that this menu revamping paves the way for iPods in which other media are equal-class citizens to music. Will we see a future iPod that also has a main menu item named Photos? Or Videos? Or Games? From a user-interface perspective, that foundation is now in place. Think of it this way: If Apple wasn't planning to make other media equal-class citizens, why add a main menu item for Music? Why have a menu item called Music for what is only a music player? It's fun to speculate -- but in the end, it'd be more fun to be able to update my 3G iPod to have at least a few of the new capabilities of the newest iPod. 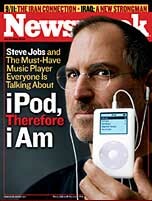 Newsweek magazine has details on a new, fourth-generation iPod as part of a cover story on the -- hold your nose -- iPod Nation. Same white case, and about the same size (about a millimeter thinner). The four control buttons are replaced by a clickwheel, the lovely and versatile controller that first appeared on the iPod mini. Menus have been reorganized, with Shuffle playback control making its way to the main menu. Longer battery life betweeh charges -- up to 12 hours of playback time, thanks to better power management, according to the Newsweek article. A C-note cheaper: 40GB for $399, 20GB for $299. Some cool new features. According to Newsweek, "you can create multiple on-the-go playlists and delete songs from those ad hoc mixes. And audiobooks are not only easier to find, you can listen to them at normal speed, slower or 25 percent faster, without its sounding like a Munchkin." So it looks like another solid step forward for the leading portable music player: a better user interface, better battery life, cool enhancements for audiobook listeners, and more options for creating and working with playlists while on the road. Well and good. Now what about that third-generation iPod in your pocket? It'll be interesting to see how many -- if any -- of these new features come to older iPods through a software update. Prediction: few if any. The real-time playback speed adjustments almost certainly require signal-processing hardware that only the 4G iPods will contain. And while the revamped menus and enhanced on-the-go playlists would seem to be something Apple could give to owners of older iPods as a small obsolesence consolation, the company may want to withold these welcome additions to encourage upgrading. We've seen signs of this with previous iPod software updates. I hope I'm wrong and that Apple releases an iPod software update that adds the enhanced menu and playlist features to 3G iPods and the iPod mini. Prediction #2: Expect to see more iPods on eBay. It's been more than two weeks since I've posted anything! Shameful. Was it because I was in Boston at Macworld Mini? Nope. I stayed home -- partly to attend a family get-together in Palo Alto, and partly to ramp up for next week's Digital Design World conference in Seattle. I'm the Conference Chair of the Web design portion of the event, a role I've had since 1997. I'm still on the swamped side, but I did want to let you know about a couple of radio-related developments. More great old radio. Back in May, I wrote about RadioLovers, a site containing hundreds of classic radio shows that are free for the downloading. Yesterday, while researching an upcoming Macworld article, I stumbled on two more sites that radio lovers should enjoy. If you're like me, you grew up listening to at least some Top 40 radio stations of the 60s and 70s. Have I got a Web site for you. It's called Reel Radio, and it's a collection of more than 1300 aircheck tapes -- recordings of radio shows made by the DJs and hosts themselves. There are some classic gems here, and some great DJs from around the country (including some from my home town of Pittsburgh). You'll not only hear the songs from that era, you'll also hear all the DJ banter and all the commercials. There are enough aural gems here to keep your ears busy for months. Reel Radio streams its recordings in RealAudio format, so if you want to record them and add them to you iPod, you'll need to use a program such as Audio Hijack. More hits from the Tri-State area. Thanks to the Links page on Reel Radio's site, I found Jeff Roteman's Radioville, another treasure trove of radio lore and recordings. Radioville specializes in many Pittsburgh-area radio giants from my youth: KQV, 13Q, WTAE. Chicago's titanic WLS is also represented here, among others. Radioville also streams its content in RealAudio format. Note: The site makes obnoxious use of pop-up ads. Back to the present. Tonight, I'll be a guest on Gene Steinberg's Internet radio broadcast, The Mac Night Owl LIVE. The show airs from 6 to 8pm Pacific time. We'll talk about Tiger, iLife, and much more. It's vacation season in much of the world, but not for me. I'm chained to my desk wrapping up a final edit on a new Avondale Media instructional DVD. We're just a few weeks away from releasing "Secrets of the Photoshop Masters, Volume II," and it's looking great. My wife and I are going to be vacationing this year, but not until autumn, when we head to Holland, Belgium, and Paris for a couple of weeks. This will be my first European vacation with a digital camera, and I've been fretting about how and where to store the photos I take on our trip. I won't be taking a PowerBook along -- it's too big, and I won't allow myself to be distracted by the pleasures of pixel pushing. When I'm in Europe, I'm in Europe, and I'm not spending hours hunched over a trackpad. I won't allow it, and ahem, neither will my wife. So that means either buying a lot of Compact Flash cards or using some kind of portable photo storage device. I'm weighing a few options, and I thought I'd list them here and solicit your feedback. If you're about to hit the road, maybe you'll find some useful options here. iPod media readers. My iPod will be accompanying me, which means I'll have a large hard drive close at hand. Belkin makes two products that let you offload photos from a memory card to the iPod: the Belkin Media Reader for iPod and the newer Digital Camera Link for iPod. I reviewed the Belkin Media Reader for iPod on this site last October. While I love its ease of use, its slow transfer speed leaves something to be desired -- you can drain the iPod's charge with a single photo-transfer session. I'll be shooting 5- and 8-megapixel images on my trip, so this baby isn't an option. The Digital Camera Link looks similarly sluggish -- it unites iPod and camera via a USB cable, so it can't be that fast. SmartDisk's FlashTrax. This intriguing device is what some people (not necessarily me) hope the iPod will become. The FlashTrax contains a hard drive (between 40GB and 80GB), memory card slots, and a 3.5-inch color screen that lets you view your shots. I like the idea of a built-in screen: being able to see your shots before erasing them from a memory card gives you the assurance that the photos were actually copied. The FlashTrax can accommodate any photo format, including raw. It can even play MP3 files, though it doesn't support AAC or other iTunes-specific formats, so it won't replace the iPod in my suitcase. But I'm nervous. By the end of my trip, I'll have thousands of photos stored on this one hard drive. What if it breaks during travel? What if a security guard drops it? What if it's stolen? What if I spill Belgian beer on it? Portable CD burner. Its name doesn't exactly roll off the tongue, but the EZDigiMagic has other appeals. It's a portable, battery-powered CD burner with memory-card slots: insert a card full of photos, press a button, and the photos are burned onto a CD-R. I like the idea of having photos backed up across multiple CDs. CDs are relatively rugged, they're impervious to magnetic fields, and by not relying on a single hard drive to hold all your shots, you aren't putting all your eggs in one basket. But here come the worry warts: The EZDigiMagic doesn't have a screen or an LCD; it simply flashes a light and beeps when the burn is complete. I'm not sure that instills enough confidence: "Honey, the burner beeped -- time to delete all those photos from the card!" CD burners are fairly fragile, too -- can I throw this baby in a suitcase day after day for a couple of weeks? And how many AA batteries will I go through? Strength in numbers. In the end, I may just adopt a redundant strategy: maybe the iPod and a Belkin reader and the FlashTrax. Or maybe FlashTrax and EZDigiMagic. If I spread my photos across multiple media, I'll stand a better chance of arriving home with all of them. What do you think? Have you used a portable photo-storage device? If so, write to me and let me know what worked for you. I'll share your replies in a future posting. Is it classy to scream "class"? My book/DVD, The Macintosh iLife '04, is out and selling briskly. I've already received kind emails from all over the world, and I thank everyone who has written. I've posted video excerpts and the new edition's table of contents (for the book and DVD) on this site's about page. Check them out and see why Phil from Australia wrote, "From the DVD to the book, everything about this package screams class."